The WVI team are on their way back from a very long week helping Jivdaya Charitable Trust at their temporary Avian A&E. Headed up by vet nurse Matt and vet Stefan spent the week sewing partially severed wings back on to birds of prey and a few other non-pigeon species. They were assisted by final year vet nurse Ashley who carried out a project comparing different types of anaesthesia. As part of our Raptor Rehabilitation Programme, the team were in Ahmedabad, India, assisting and training up JCT vets, staff and volunteers in the entire rescue and rehabilitation of the non-pigeon species. They have built on protocols drawn up by WVI and JCT over the years and ensured that current ones are fit for purpose. Both the pre- and post-surgery treatments can significantly increase the birds' ability to survive their injuries and surgery AND recover quicker in the rehabilitation phase. All of this results in a greater chance of survival back in the wild. The plight of vultures is so desperate in India that the local population of Asian white backed vultures has all but gone. 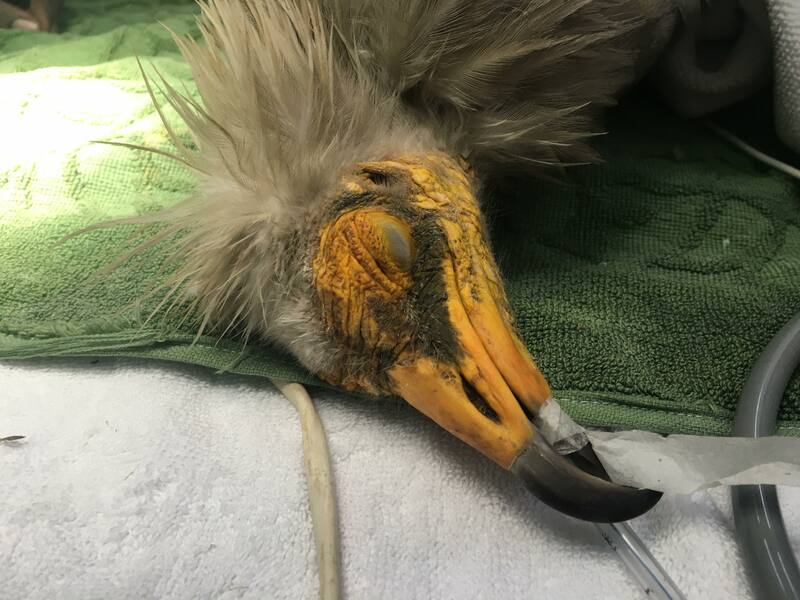 Our team haven't seen vultures for a number of years and so while sad to see a vulture with a partially severed wing, it is a relief to have this Egyptian vulture on the table and be able to save him. There are more pictures from the week on Facebook, Twitter and Instagram. Please like and follow us. AZEVN and the Colchester Zoo teams for running and cycling for this programme.